E3 is next week which means lots of new games to check out! 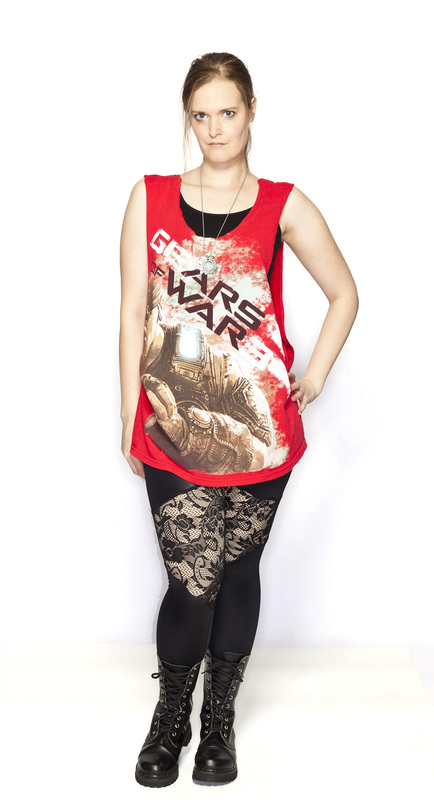 Since I’m both in the industry and love playing games, I thought it would be fun to put together an outfit from one of my favorite games, Gears of War. The shirt was totally a great thrift shop find. I decided that I would transform it from an over-sized shirt into something that was a little more my style. You can check it out in this post. My suggestion is to definitely check out the men’s section of thrift stores. Many times you’ll find great shirts that may have been a free giveaway or is just too large. However, that means it’s great for altering! You can also nab shirts at conventions too. 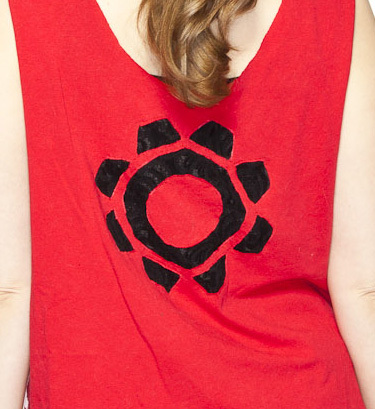 Since this top features dropped armholes, I just layered over a basic black tank. 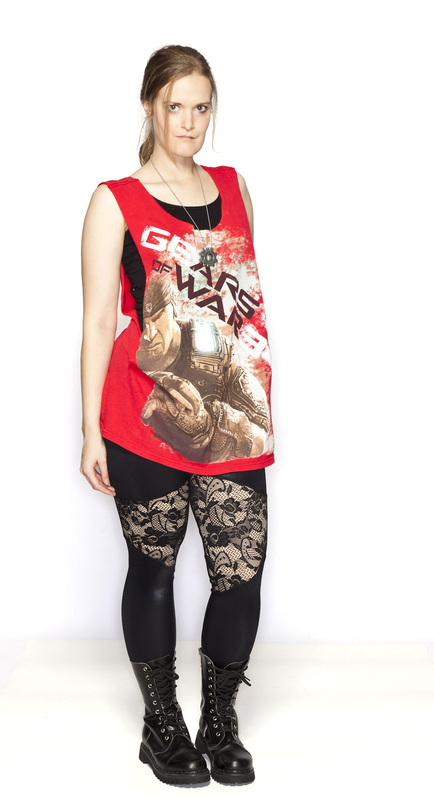 While I’m a fan of a lot of Blackmilk Clothing’s more geeky items, I also have a few items that are a little more versatile and can be incorporated into multiple outfits. 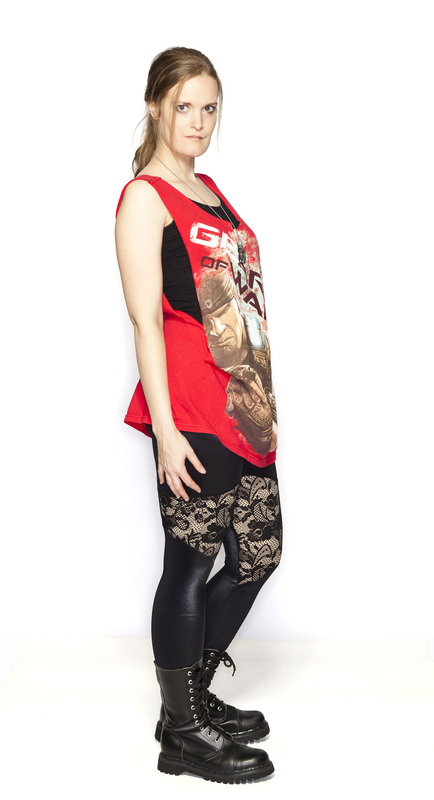 That’s definitely the case with the Spartens Lace Leggings. I knew they would be perfect since they play off the lace that is incorporated in the gear on the top. However, since they were black, I knew they they would blend in well while still providing that unique look I was going for. Now, I knew with this outfit, I’d need shoes that would match the look I was going for. So there was no hesitation when I chose a pair of black lace up boots to complete the ensemble. 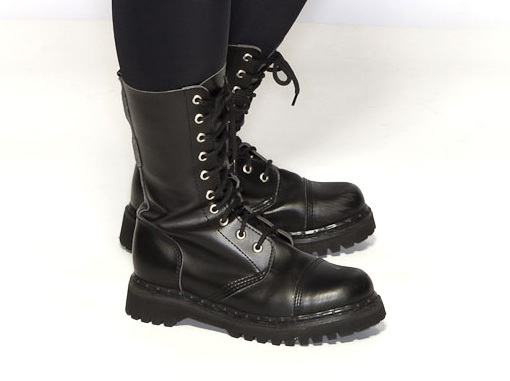 I actually bought these boots at Hot Topic years ago, but luckily black lace-up boots haven’t gone out of style. The main accessory for this outfit was definitely the Lancer! Ha, just kidding, but how great would a Lancer purse be? 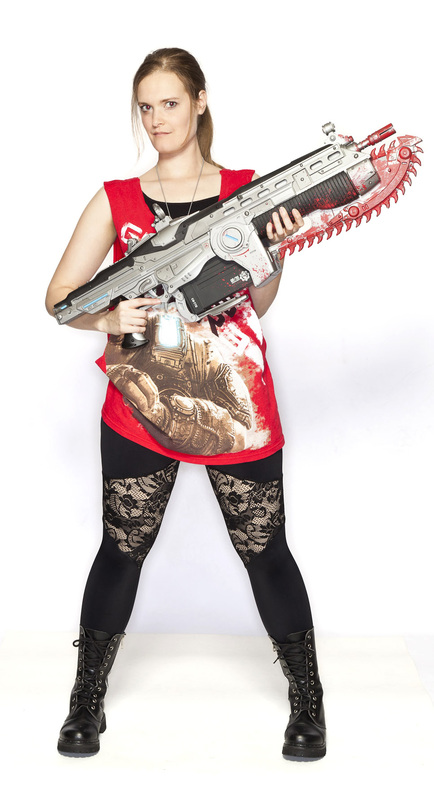 The actual accessory which is totally available at Thinkgeek for $2.50 right now (seriously, such a good deal!) 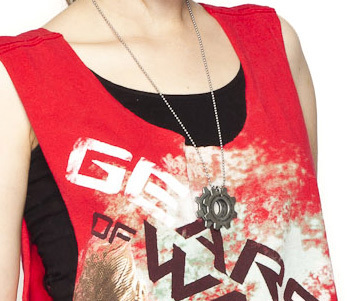 is the COG Tag necklace. If you’ve played any of the games, this is a must have fashion item. My favorite part about the necklace is the gears have some heft to them. You could even change out the chain for something a little more fashionable. You could go a step further, and maybe add a little blink to the cogs. Although personally, I like them the way they are. Feel free to give us feedback on our Looks, or share your outfits or styling tips with us on Facebook and Twitter.